When the Jackets play host at Bobby Dodd Stadium on Saturday, eyes are trained on Paul Johnson’s triple option offense and opportunistic defense. Yet in the same confines is another spectacle on the sidelines: that of the cheerleaders, notable athletes in their own right. Ali Mac Jinks joined the cheerleading team during her third year at Tech. Now in her penultimate fall on campus, she balances cheer with a rigorous extracurricular, social and academic schedule. She also works as a Georgia Tech tour guide, is on the LEAD recruitment team, does speaker procurement for TEDx Georgia Tech, is a member of Alpha Delta Pi, and plans to work at Capital One following her graduation in the fall of 2017. The Technique sat down with Ali Mac to learn more. Technique: What got you into cheerleading in the first place? Jinks: I started in cheering in middle school. I always had one of those peppy personalities so it was kind of an expectation for me to be a cheerleader, and so I started in middle school, really liked it, continued to like it in high school, but then I didn’t know if there was an opportunity for me to cheer in college. … It turned out that there was a team that I could try out for when I was a third-year. Technique: How did you find out about that opportunity? Jinks: From friends who were cheerleaders. Technique: Do you cheer in competitions or do you focus on game-day festivities? Jinks: I am on the Navy squad, which is our spirit, no- competition squad. We do gamedays and appearances. Technique: What is the practice schedule like on average? Jinks: For the team that I’m on, we practice Tuesdays and Thursdays for 2.5 hours, so five hours a week, but the Gold and White squads, which are the skill squads, have Sunday practice as well. They also have morning workouts two days a week. Technique: Which cheerleaders travel with sports teams? Jinks: My team, the Navy team doesn’t, but the Gold team travels to away games. Technique: What is your favorite thing about cheerleading? Jinks: It’s a really fun way to exhibit your school spirit and get that out of your system. I know that Georgia Tech sometimes is not the most fun or competitively successful place in terms of athletics, but it’s still so fun to go out there and get people amped because we love our school, no matter what. Technique: What is your least favorite aspect of cheerleading? Jinks: Either when a game ends or noon games, because we have to be at the stadium really early for Yellow Jacket Alley. 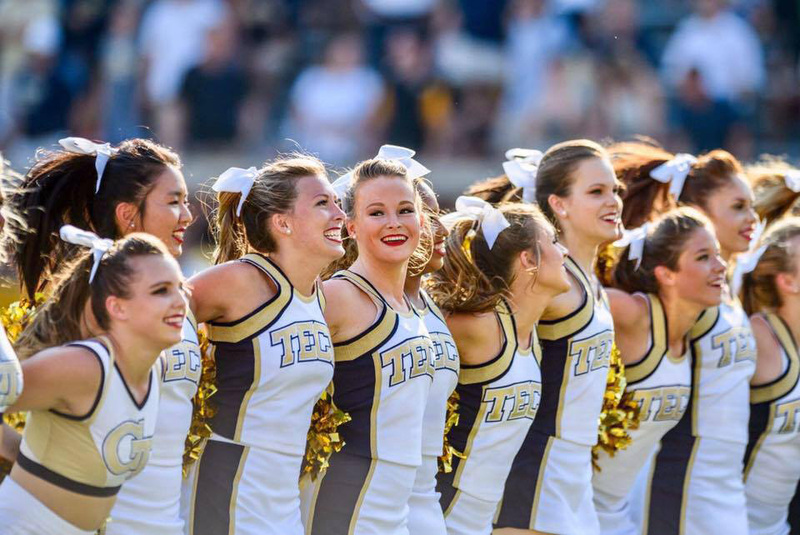 Technique: What is your favorite memory from cheering on the Jackets? Technique: If there was one piece of advice you could give to someone thinking about becoming a Tech cheerleader, what would it be? Jinks: I would say do it. I think that with our cheerleading program, there’s opportunities for a lot of different people. You don’t have to have to be the best tumbler or you don’t have to have certain skills. If you have passion about our school, then that’s enough to be a cheerleader.